Go to FALLdance.org/space-is-the-place to learn more about this ongoing project and to see photos from space is the place, part 1. NASHVILLE, TN – After a successful inaugural performance presented by the Artist’s Lounge at OZ Arts Nashville, the collaborative series space is the place returns Saturday, May 14th. space is the place is a collaboration between choreographer Laurel Desmarais and Nashville-based contemporary and aerial dance company, FALL. Presented by abrasiveMedia, this interactive movement installation explores scenes of personal space and awareness while doing away with the barriers separating viewer and performer, inviting the audience to awaken their senses and connect to the ever-changing environment. The performance will feature new music by Black Cat Sylvester and costumes by Lily Guilder Design. 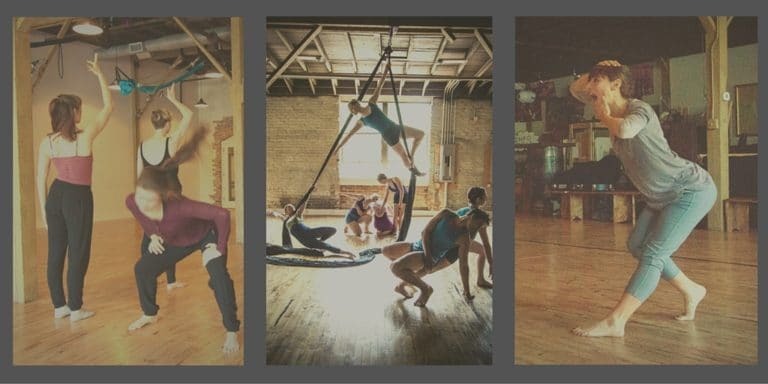 FALL is a Nashville-based contemporary dance company founded in 2010 by Rebekah Hampton Barger with a goal to utilize elements of aerial dance, site specific work, and collaborations with other artists and genres to expand the bounds of contemporary dance. FALL moves in all dimensions to make innovative, exciting and unexpected art, inspiring audiences by presenting rich, authentic performance experiences. Caitlin Stolley is the designer and owner of Lily Guilder Design. She started her career as a costume designer working in television, film and off- Broadway theatre in NYC and LA including gigs on “Law and Order” and “Rescue Me.” The clothing line was born from frequent requests for festival custom order pieces and is available at lilyguilderdesign.com. She earned her BS in Theatre at Northwestern University with an emphasis in costume design, dance and art. Attention to detail, sharp tailoring and the danceability factor are of utmost importance in each piece she designs. Black Cat Sylvester is a Nashville based DJ and music producer who plays an instrument of his own invention called the synth table. Has worked with such artists as Futureman and Jeff Coffin; including co-producing and programming The Black Mozart. In addition to performing and he is currently developing new music software for the synth table. For this performance, Black Cat Sylvester will be joined by CIA (Call It Anything), a group of trained and professional musicians interested in instrumental exploration. The highly improvised nature of this project allows the collective to break conventional rules and use free-form structure to create unique soundscapes. FALL is a resident program of abrasiveMedia and receives fiscal sponsorship, rehearsal space, and administrative and promotional support. For more information about our residency programs, click here.